To get all the benefits that a Blu-ray Disc player offers it should be connected to a home network and the internet. One way to do this is with Wi-Fi. The appearance of the onscreen menus and path labels for Wi-Fi setup may vary slightly depending on brand and model number of Blu-ray or Ultra HD Blu-ray player but includes the steps outlined below. Make sure your network is working. You'll need to ensure your devices are connected to the internet and the connection is reliable. In order to connect to Wi-Fi, you need a wireless router. Connect your Blu-ray player to your TV and turn it and your TV on. Your player will start the initial setup process. As you go through the initial setup process, your player may automatically search for available networks or you may be asked to choose between a wired or wireless (Wi-Fi) network before it searches. For Wi-Fi, choose Wireless. Once the network search is completed, you may see several listed. Select your network from the provided list. After selecting your network, enter the Network Password (key) when prompted via the cursor buttons on your remote control. Wait for the player to confirm your password. Once confirmed, the player is connected via Wi-Fi to your network and the internet. Upon connection to Wi-Fi, the player may prompt you that a software or firmware update is available. If so, click "Yes" and allow the player to execute the update. Never turn off your player or try to perform another function while the player is being updated. After updating, you will be prompted through the rest of the player's setup procedures. If you want to switch from a wired connection (discussed later) to Wi-Fi, have installed a new wireless router, or changed your Internet Service Provider (ISP) you can go into your player's onscreen setup menus at any time and re-establish your Wi-Fi connection. Turn on your Blu-ray Player and TV and select the input on the TV that the player is connected to. From the Player's main menu screen, click on the Setup or Settings Icon. Open Network (exact location and wording may vary). Click on Network Settings. If your Network Menu also has a selection labeled Network Status as shown above, you can click on it at any time to see if your internet connection to the player is active. You should see both wired (Ethernet) and wireless (Wi-Fi) options listed, as shown in the previous Wi-Fi connection setup steps. Select Wireless or Wi-Fi. The player will scan for any available networks. Choose your network from the list. If connecting to Wi-Fi is not successful, or you find it unstable, try one, or more, of the following steps. Move your wireless router and Blu-ray Disc player closer together, or get a Wi-Fi extender for your router and try connecting again using the above steps. If Wi-Fi connection attempts fail, use an Ethernet Cable to connect your player to your router. Go into your Blu-ray Disc player network settings menu and select wired. Two additional ways you can use to try to connect your player via Ethernet or Wi-Fi is with the PIN or PBC setting methods. Consult your user guide for specific details for your player. If none of the above options work, contact your Internet Service Provider (ISP) for assistance in entering your router's IP Address and DNS Server information manually if your player provides this option. If the assistance from your ISP doesn't solve the problem, contact the player's customer support for additional help. Some early model Blu-ray Disc players do not provide internet connectivity. However, all Blu-ray Disc players made after 2008 to the present are required to include internet connectivity, but it is not a requirement that Wi-Fi be provided. This means that although most Blu-ray Disc players provide both Wi-Fi and Ethernet, some may only provide Ethernet. 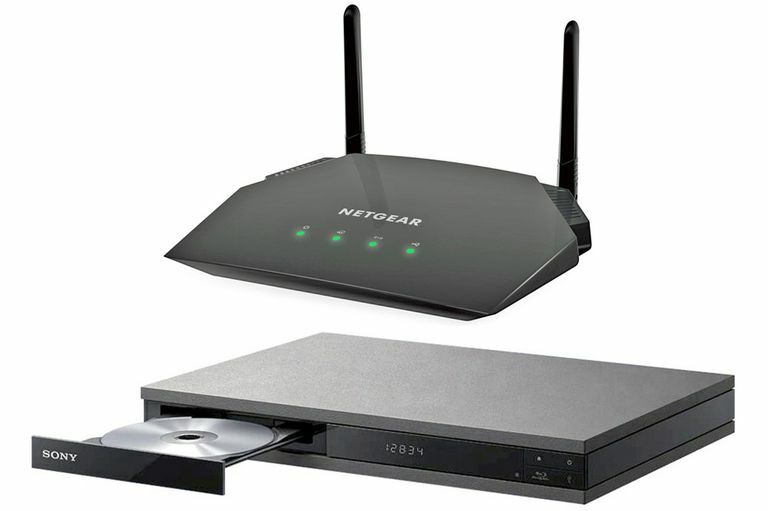 It may be possible to connect to an Ethernet-only Blu-ray Disc player to Wi-Fi using an Ethernet or USB Wi-Fi Adapter. Consult your user guide or contact customer support to see if you can use a Wi-Fi Adapter and which ones may be compatible with your player. When a Blu-ray Disc player is connected to the internet and a home network, it provides access to one or more of the following depending on the brand/model. Firmware/Software Updates: Keep your player updated with the latest fixes and features. BD-Live: Access to special features and content available for selected Blu-ray Disc titles that can only be accessed from the internet. Optional Features: Provided at the discretion of the Manufacturer.